Villa Valente is a beautiful six bedroom villa with amazing facilities including air conditioning, internet, fireplace, heated pool, private barbecue, enormous landscaped gardens. Villa Valente is a beautiful six bedroom villa with amazing facilities including air conditioning, internet, fireplace, heated pool, private barbecue, enormous landscaped gardens, turfed mini-football pitch, volleyball court with beach sand, ping-pong table and lots of comfortable chill-out/ outdoor furniture in several areas, private parking. Situated in a rural area of great tranquility and privacy in the Silves to Albufeira area, Algarve, yet just a five minutes’ drive to the nearest shop and restaurants and around 15 minutes’ drive to the nearest beach. 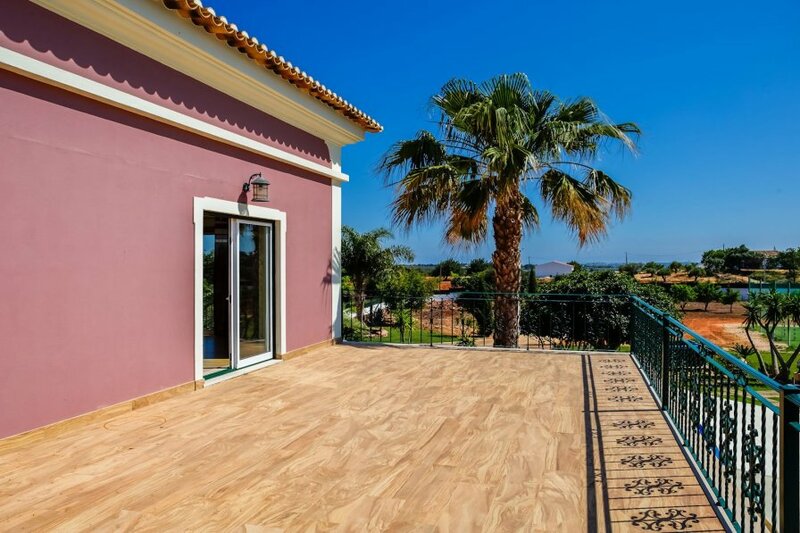 It’s a fantastic villa offering modern and well-kept decoration, situated in a quiet area of the countryside and only a few minutes’ drive from the resort of Albufeira. The property features well-maintained pool and gardens as well as an outdoor dining area, plenty of natural light and with doors opening onto the pool and barbecue area. All bedrooms and living room have air conditioning, remote control and allow heating on cooler days. It is built on a plot of 13400m2 with a fabulous private landscaped garden. A large terrace adjoins the private pool with an awning shaded dining area. The pool can also be heated for a supplement and there is also a heated hot-tub here too. Ample parking, with automatic gate at the entrance. 1 bedroom suite with double bed and access to large terrace. 1 bedroom suite with double bed in the attic, with 2 sofas and TV with cable channels. 1 Full bathroom with bath and shower cubicle. 1 Full bathroom with bath. 2 full bathrooms with walk-in shower. 1 Bathroom of service, of support to the outside. Large living room, dining area and kitchen; living room with corner sofa, LCD TV with cable channels and fireplace. When you go up to the 1st floor, you will find a living room with a sofa and a TV with cable channels. Modern and fully equipped kitchen with electric hob and oven, American fridge, dishwasher, coffee machine with capsules, electric mixer, juicer, electric kettle, microwave and other kitchen utensils are available. Barbecue with support bench and dishwasher. Heated pool - on request, up to 48h prior to arrival. Sun loungers and parasols are laid out around the swimming pool. Large garden with lawns, different trees, flowers and vegetation. Linen and towels for advertised capacity. Electricity, water, gas and cleaning included.